Bo Xilai's Corruption Trial In China Kicks Off With A Twist : The Two-Way It's common to see cowed defendants admit to crimes during Communist Party show trials. But disgraced former politburo member Bo Xilai began his trial with vehement denials of guilt, calling one accuser a "crazy dog snapping at things for reward." In this photo released by the Jinan Intermediate People's Court, Bo Xilai appears Thursday on the first day of his trial in eastern China's Shandong province. Interestingly, he was photographed flanked by two very tall policemen. In China, recent Communist Party show trials have featured cowed defendants acknowledging their crimes and offering apologies. Not this one. 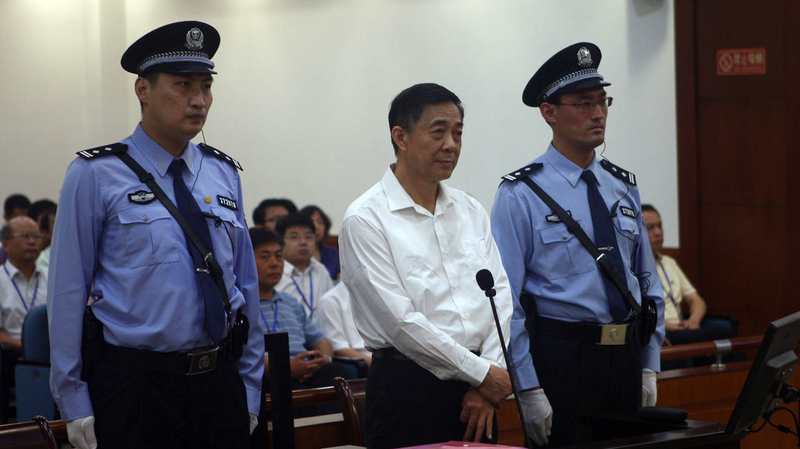 The country's biggest trial in decades kicked off Thursday with the defendant, former politburo member Bo Xilai, denying guilt, claiming his confession was coerced and branding the testimony of one of his accusers — in this case his wife — "laughable." Although the case was not broadcast live, the Jinan Intermediate Court in east China's Shandong province live-tweeted the proceedings. As court adjourned around dinner time, it wasn't clear whether Bo had gone off-script with his fierce denials or this was the script. If it was, it was unconventional by recent standards. Bo is charged with abuse of power for allegedly obstructing the investigation of a case that saw his wife convicted of murdering a British businessman in the southwestern city of Chongqing, where Bo was party boss until he was removed last year. Bo also is accused of taking about $3.5 million in bribes from two businessmen in northeastern China, where he had earlier served in top political positions. Tang Xiaolin, general manager of Dalian International Development Group, said in written testimony that he had bribed Bo. In response, Bo, wearing a white dress shirt and dark slacks, called Tang a "crazy dog snapping at things for reward" and said Tang was making claims to try to reduce his own prison sentence. Bo also called Tang's written testimony — Chinese defendants do not have a right to confront their accusers — "the ugly performance of a person selling his soul." In other written testimony, Bo's wife, Gu Kailai, said she took large sums from their home safes in different cities and used the cash to pay for the education of their son, Bo Guagua, in England. Bo wondered whether Gu could remember the amounts she took, while his lawyer described her as "mentally unsound." Bo's career began to unravel last year when his own police chief in Chongqing, Wang Lijun, fled to the safety of the U.S. consulate in Chengdu. Wang apparently revealed to American officials that Gu had killed the British businessman, Neil Heywood. No one doubts that Bo will be found guilty at the trial. The case is largely seen as the result of a power struggle at the highest levels in China. The Communist Party is above the nation's judiciary, and despite officials' frequent protestations to the contrary, China does not have the rule of law. But appearing for the first time in public in months, Bo was dwarfed by two very tall cops standing on either side of him in the courtroom in Shandong, which is known for strapping men. After seeing the courtroom picture, one Chinese netizen, or web-user, wrote: "I finally got why the trial is arranged in Shandong."